Russia has proposed extending the mandate of the UN mission on chemical weapons in Syria to Iraq, where it claims ISIS militants may be behind production. However, some media see this as Moscow diverting attention from the actions of Syrian President Bashar al-Assad and delaying a resolution on chemical weapons in Syria. Some Western media are accusing Russia of delaying the establishment of a new UN body to investigate the use of chemical weapons in Syria, arguing that Moscow is trying to shift the focus of the investigation to what is happening in Iraq. Western countries have traditionally accused the Syrian authorities of using chemical weapons and see Russia’s attempts to hold up the process as an effort to shield Syria’s embattled president, Bashar al-Assad. Earlier, on Sept. 2, Russia's permanent representative to the UN, Vitaly Churkin, said that the Security Council might need to adopt a new resolution that would concern the investigation of the use of chemical weapons not only in Syria, but also in Iraq, in this case – by Islamic State (ISIS) militants. Churkin also said that Russia wanted clarifications of some aspects of how the international body, which is being established by the UN to assign blame for chemical attacks in Syria, will work. In early August, the Security Council unanimously adopted a resolution on the need to investigate the use of chemical weapons in Syria. Later, the United Nations secretary general, Ban Ki-moon, sent a letter to members of the Security Council, in which he proposed the establishment with the Organization for the Prohibition of Chemical Weapons of a joint investigation mechanism (JIM) for dealing with such crimes in Syria. It was assumed that the decision to establish this mechanism would be approved within five days. Churkin said on Sept. 2 that the Russian Federation has questions about how the new body should operate, and Moscow has already addressed its concerns to the general secretary. According to the diplomat, Russia now wants Ban's clarifications to be put in writing and circulated to the members of the Security Council "so that everybody has the same kind of understanding" about the way the JIM will function. According to Sergei Demidenko, an analyst who specializes in the study of problems of the Middle East at the Institute of Strategic Studies and Analysis, a nongovernmental expert center, the accusations against Churkin and Russia look unfair. The analyst recalls that it was Russia that initiated two years ago a program to remove chemical weapons from Syria, which was supported by the United States. All the organizations that control this process, including the UN, said then that all chemical weapons had been removed from Syria, and the suspicions of the use of chemical weapons by Assad were not confirmed. "All these accusations [against Russia] should be considered in the context of the international situation that has now formed around Russia," said Demidenko. The analyst stresses that there is a very delicate balance inside Syria and around it. According to Demidenko, Churkin upholds the principle that "you should not greatly weaken the regime of Bashar al-Assad, otherwise he simply will be eaten." At a press conference dedicated to the start of Russia's presidency of the UN Security Council, Churkin mentioned one of the reasons why Moscow had appealed for the UN Secretary General for clarifications on the new initiative regarding use of chemical weapons and defer the consideration of this issue for the time being. It was assumed that the new body should operate based on voluntary donations. Churkin wondered whether this would influence its impartiality and whether it would depend on who is funding it. At the same time, Churkin stressed that it would take no more than a few days to clarify the group’s principles of operation. Commenting on claims against Russia's steps on the initiative as voiced by Churkin, Yevgeny Satanovsky, director of the independent Institute of Middle East, called them "part of information warfare." Satanovsky drew attention to the question of the "origin of the chemical weapons used both on the territory of Iraq against the Kurds and in Syria." According to him, "this is clearly one source – laboratories in Iraq. 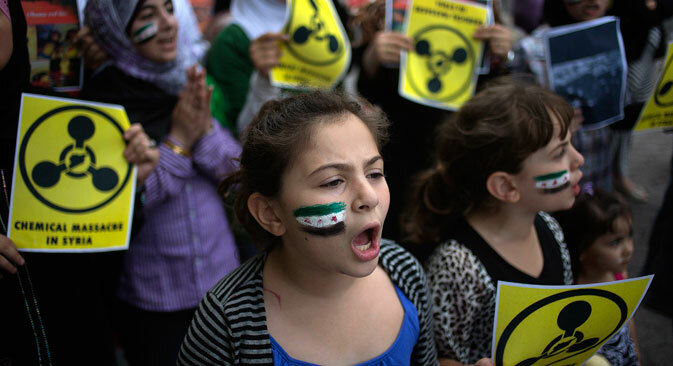 They produce primitive but effective chemical weapons such as mustard gas." Clearly, Assad cannot control these particular laboratories. Russian experts were keen to emphasize that in the situation of chemical weapons, as is the case of other issues related to Syria, Moscow’s support for Assad is not an end in itself. The main goal is not to let Syrian statehood finally collapse and to prevent the situation descending into uncontrolled chaos. At the same time, some analysts point out that the position of the U.S., which alleges that the key to solving the problems of Syria is the departure of Assad, is not without reason. "If, hypothetically, Bashar al-Assad wins in Syria, then there is no one to restore the country,” said Demidenko. “Nobody will give loans while Assad is in power, while Syria alone will not cope with such problems. Assad will still have to go. But not now."